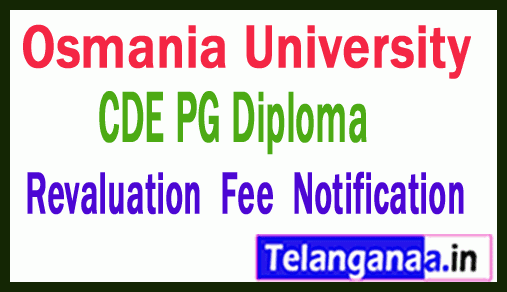 Osmania University CDE PG Diploma Revision Fee Notification 2019 January: Prof. G. Reddy Center for Distance Learning (PGRRDE) has approved the examination fee declaration 2019. Many candidates are eagerly awaiting this review. All the required candidates can access and download this page. Bank draft for the required examination fee, as shown below, Director, Prof. G. In favor of Ram Reddy Center for Distance Learning, Osmania University, Hyderabad. Internet Memo Reclaimation requests will be accepted from 21.12.2018.